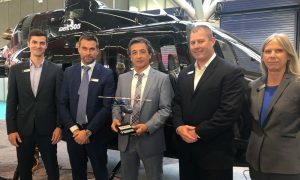 Bell Helicopter and Turbomeca announced that Turbomeca has received EASA engine type certification for its Arrius 2R engine, that powers the Bell 505 Jet Ranger X. The Bell 505 redefines the short light single (SLS) class, placing safety, performance and value at the forefront. With seven million flight hours already logged by Arrius variants, the 2R is expected to offer unmatched high level of maturity at entry-into-service. Officially launched at the 2013 Paris Air Show alongside the Bell 505, the Arrius 2R has followed a fast development schedule. During a rigorous evaluation campaign, starting in April 2014 with its first ground run, the engine has logged more than 2,500 ground test hours. The flight test campaign started in November 2014 with the Bell 505’s first flight at Bell’s Mirabel facility in Canada. In August 2015, Turbomeca delivered the first production engine to the new Bell 505 assembly center in Lafayette, Louisiana. The Arrius 2R is designed to deliver performance and power within the 500 shp range, while improving safety and lowering pilot workload via the dual-channel FADEC. It is the only turbine in the power range with this feature. With the proven Arrius 2F at its core, the twin-module configuration offers low maintenance and operating costs. Reliability comes as standard and is reinforced by a 3,000 hour Time-Between-Overhaul offered at service entry. The new variant will also benefit from Turbomeca’s renowned service and support capabilities. To date, more than 3,000 Arrius engines have been sold by Turbomeca, to 430 customers in 60 countries.